Hi Kevin. Good piece in the Record today. As someone who voted Yes your blog makes difficult reading but you are correct to point out many of the economic flaws in the Yes campaign. Taking difficult medicine is important for yes campaigners about where we went wrong. On currency and a lack of honesty about Scotland's finances, the SNP's case for independence was indeed flawed. However I think it is fair to say all recent politicians in the UK that have overseen tax and spending policy are in the dock when it comes to Scotland's finances. Labour to their credit achieved I believe 4 budget surpluses in their 13 years in government and perhaps then share less of the blame. However, they created far too many jobs in the public sector than is sustainable. The over dependence on oil for tax revenue was always unsustainable and politicians of all colours have buried their heads in the sand on this one (except the Greens). We shouldn't forget the tax revenues from oil have also propped up the UK's public finances and was it not for peak oil prices between 1975 and 1995, the UK's many deficits and borrowing would be even worse than they are now. Scotland has no power to reduce our spending levels. We are given a fixed budget and reserved spending is also fixed. Defence expenditure in Scotland for example of £3 billion is way too high for a country of Scotland's size. Neither Labour/Lib Dems or the SNP have used the limited tax powers of the Scottish Parliament which is where they both fall down too. Independence is now off the table for the forseable future, probably forever. Labour, the Tories and the Lib Dems are quite right to capitalise on this moment and hammer the SNP. But the harsh reality is even as part of the UK, Scotland must raise taxes and lower public spending. Because every pound spent serving Scotland's deficit to support Scotland's spending, means more cuts to local services in England. Surely what the GERS figures show is that Scotland can't go on like this. "If we take oil revenues out of the picture, the GERS figures show that Scotland’s deficit would have exceeded 10% of GDP in every single one of the last 13 years"says Kevin but that is patently ridiculous. If there had been no oil then a responsible and competent government of an independent Scoutland would have structured our economy in an entirely different way to the one Westminster has done as, by the way, it would have had we been independent with high oil prices. Continual, sneering references to Ireland and Greece, as if they are the only valid comparisons to an independent Scotland, simply reflect Kevin's prejudice and lack of vision. The GERS figures are the way they are because Scotland has historically not well served by Westminster. Its strategy to sort out its deficit problems (should I refer to the UK's deficit as a "black hole"?) and its mounting debt has proved disastrous and what Scotland needs now is to make better decisions in its own interests than the ones which have been taken till now. Will it be easy? No, of course not, but the alternative, that got us here in the first place, is not an option. I'm for stopping digging! The argument that Westminster hasn't served us well suggests you didn't manage to read the full article - our (notional, as long as we're in the UK) deficit is due to higher public spending not lower economic productivity. You're right we couldn't have sustained this level of deficit had we been independent and we certainly couldn't looking forwards given the realities of oil. So yes things would have been and would need to be very different and the conclusion that we'd need to slash public spending is simply unavoidable if you're willing to apply rational thought. That doesn't mean we couldn't or maybe even shouldn't be independent - but it does mean that an honest presentation of the case should front up to that reality. The Yes campaign didn't and the SNP don't. "This means that the taxes we raised in Scotland fell £14.9bn short of covering the public spending we received." Nowhere in GERS 2014-15 is the claim made about "taxes"
GERS uses the misleading term "Revenues". For example DWP pays direct to BBC the "over 75s TV Licenses", GERS includes this as "Scottish Revenues"
£600 million + of Business Rates are funded from the public purse, £2 billion or less is collected , yet the Scottish consolidated fund is credited with £2.5 billion. GERS and the term onshore! It does not mean onshore Scotland. You are doing a great job, but it seems even you are fooled by the snp deceitful half truths, if they have managed to 'con' you what chance has 'joe public' got? Kevin, I come from a similar position to Drew. I voted Yes and I still believe its in the long term interests of Scotland to be self governed. I hold my hands up and admit in all reality we dodged a bullet with the No vote (at least in the short term). I think your presentation of the numbers are fascinating and I especially like your spaghetti like mapping of all EU countries. I think their is solace to be taken from the performance of all the other comparable EU countries that an independent Scotland would be perfectly able to function and may also, given time, be able to perform better than the UK which as a whole has been in the relegation zone for the past decade or so. Indeed the scale of Scotland's current woes (as forecast by GERS) are at least in large part a function of being so intrinsically tied to a relatively poorly performing UK over which there is little control. There are obviously huge questions to answer around currency and how Scotland's economy would need to be re-structured but if more of the independence movement would engage with the figures rather than dismiss them and more on the no side would stop gleefully holding them up as vindication then we might get closer to answering the important questions about how to fix them! The implications of what you are saying are that the Scottish Government should have asked for less out of the recent fiscal pact for the Scotland Bill. This would allow Scottish expenditure to come more in line with revenues raised in Scotland. Scotland would therefore be "less beholden to Westminster". The Scottish Government did the exact opposite and demanded the "no detriment" £7.6 billion. How do they square that circle? Kevin, nobody suggested the vote was about re-running the 80s In fact it was about how we could and should "run" through the rest of the 21st century. Surely the correct analysis of GERS2016 should be "the union has served us very badly economically so let's find a better way." Many of us are confused that you have concluded the exact opposite, that Scotland can only ever be poor and that we'll therefore always need the rest of the UK to prop us up. I don't buy your "higher public spending" argument either. "Greater economic productivity", managed correctly, is the main way to ensure sustained economic prosperity. Your graphs in your Reasons To Be Cheerful article are enlightening and show that even in the years of high oil prices and revenues Scotland still didn't benefit economically against rUK but that as soon as the oil price began to fall Scotland's relative deficit/GDP ratio fell too. This suggests to me that we are not Better Together at all. In Reasons to be Cheerful you wrote "What's clear - now undeniable - is that the starting point (based on taxes we're used to paying and public spending we're used to receiving) would be £1,400 per person per year worse off than we are by remaining in the UK. That's £2,800 per tax payer." But we are in government debt to the tune of about £25,000 for every man, woman and child in the UK and this was "achieved" in a Union and as a direct result of Westminster's management of the economy. You suggest we would have been nearing "the starting point" had we voted Yes in 2014 but surely we should be looking at these GERS figures, not as the state of play on that first a day of an independent Scotland but on the last day of the Union. Or, given that you Unionists prevailed, where the UK has brought us to now. Incidentally, Kevin, I notice you star in the current Wings over Scotland Great Leap Forward fundraiser. "Including North Sea revenue, tax receipts per person have also remained broadly in line with the UK as a whole, at approximately £10,000 per person." GERS forecast nothing - they merely summarise the past. They only show "woes" for Scotland where we trying to be FFA or independent. We can agree that an honest debate about our economy and how we improve it would be beneficial for all Scots whether we choose to define them as "yes" or "No" - if prefer to just discuss this as "Scots"
I'm afraid you've missed the point. When you say you "don't buy" the higher spend point - that's simply an observation of fact, how can you not "buy" it? You then confuse annual numbers (£2,800 per tax payer per year) with a cumulative share of debt figure. Finally you simply choose to assume that we'd overcome that gap and far exceed what we've achieved in the UK on the basis of ... absolutely no reason whatsoever and in denial of the very real and obvious possible economic downsides of independence. The First Minister's statement is essentially correct - this is merely semantics about "taxes" versus "revenue". per the FOI request: "Taxes consist of all revenues except National Insurance contributions (classed as compulsory social contributions), interest and dividends, gross operating surplus, rent and other current transfers, and North Sea licence fees"
Kevin, if as you say, "GERS forecast nothing - they merely summarise the past" then why are we having this discussion? You contend that Scotland's finances are in such a dire state that we simply couldn't afford to be independent. I contend that, as the current GERS figures reflect where the union has brought us, we cannot possibly afford to remain in that union. Each of us, therefore, concedes that GERS do not "merely summarise the past." Surely the first "woes" which GERS throws up and which should first be addressed is not independence or FFS but the union. I'm not saying that Scotland can't remain part of the union, of course we could, but it is impossible to see from the GERS figures over the years and from your excellent graphs how we could possibly run a sustainable economy if we carry on as we're doing. I'm simply highlighting facts (as I think you accept). Heavens but you're being obtuse. We could be independent, we'd just have to massively reduce our public spending. We could resolve that while in the UK if you like - scrap Barnett, don't take the support that the rest of the UK provides us. When you only have one answer, then every question needs to twist itself around Scottish independence. Time for you to get some new answers, I suggest. Plans to give Scotland's new financial watchdog the power to make independent forecasts of the country's tax revenues and GDP have been passed by Holyrood. I for one are pleased that SG relented. On one point re the 3% EU Deficit/GDP target for Eurozone, is acompanied by the Debt/GDP ratio of 60%, worked out well, has it not. I think that we are victims of the "Dutch disease" to a large extent.. Where as Norway had the will to avoid it I do not believe we ever would have had the political will to do so...Had we been independent..
As part of the Union we have only had a mild case...But it is still evident in our economy and more so in the SNP's economic planning. It's fresh air to have rational discourse from a (former and probably still at heart) Yes supporter above in Drew. Th economic case for independence is demonstrably dire even to the layman. We simply would not be able to afford to run the level of public services and welfare as we currently do. Fact. No ifs or buts. We simply wouldn't have been able to avoid "mass austerity" that would would make the current measures look like a tax rebate. Independence is one thing and the dye-in-the-wool Nationalist would vote for it regardless. However what should be exposed is how woefully underprepared and disgracefully deceitful the SNP were in order to get this sold. They would have put their supporters and it's ragtag bunch of socialists, republicans, anglophobes & politically disenfranchised in a very much worse position if it weren't for the 2 million 'No' voters they now hate. We in Scotland are lucky as we have our own wealth fund called the UK & the Barnett formula. Where we support each other financially regardless of the economic shocks. It's just a pity we didn't have anyone to champion it. Kevin, your analyses remain consistently spot on and are greatly to be admired, as is your patience in dealing with the obtuseness of the Yes voters. Viewed from south of the border, there is still a deal of denial in Scotland about the economic mess that Scotland increasingly finds itself in under SNP government. Three points. 1) Your correspondent, Grendal, obviously doesn't like the Union or Better Together. OK. But, unfortunately for the Scots, they are physically attached to England, and rUK is their most important trading partner. This doesn't go away with independence, because the relative sizes of the two economies (10:1) means that Scotland will always find its options limited by English behaviour. It would still be the case if Scotland were independent. Just think through the effects of higher Scottish income taxes, for example. The reason that Sturgeon has a visceral dislike of Osborne, Cameron and the Conservatives is partly that a lower income tax regime in rUK inevitably opens up a gap in the tax competitiveness of the two jurisdictions that Sturgeon doesn't like. Shouting about rUK "austerity" is part of her unsuccessful strategy for stopping the development of the increasing gap. Perhaps Grendal would be kind enough to tell us about the "new" economics that will lift the Scottish economy post-independence without the need to reduce Government expenditure or raise taxes. I can say right now that it will be fairytale stuff, pixie dust, full of "economic levers" and other SNP rhetoric. None of the SNP's voodoo economics exists in the real world. The EU would require draconian deficit reduction using conventional means, as would the IMF. 2) Sturgeon is clearly attached to the political benefits of deficit spending, and loves sniping at the rUK and Osborne for austerity (i.e. still not living within your means, but not on the same scale as Scotland). Like any good welfare beneficiary, she likes the booze, ciggies and TV, and she dislikes the generous hand that makes it possible. 3) Sturgeon and Swinney have started showing a predilection for Government borrowing and large deficits that should worry many Scots as they go forward. Because it is just like Greece. Endless freebies, an inflated civil service, no fiscal discipline to speak of, etc. It will make funding the Scottish deficit much more difficult in future. As it is, it is now increasingly clear that Osborne also has a very large deficit to confront, and this will need to be addressed UK-wide. Otherwise, there really will be a run on sterling at some stage. I do wish we could have a grown up debate in Scotland based on the GERS numbers but lets be honest the SNP and their supporters dont want a fact based discussion. Many like me make their decisions based purely on the economics as it is this which provides jobs, prosperity, pensions and benfits for our children and loved ones. Would it not be great to hear how the SNP would close the deficit based upon real policies rather than wishful thinking. Would it not be great to hear the currency proposals which affect our country's borrowing ability never mind mortgages and pensions. Would it not be great to understand the compromises we would inevitably have to make to on taxation and public spending. And what about policies which would actually grow our economy. All we get from the SNP is the wish to increase benefits, welcome migrants, etc, but sadly lacking is any plan to increase economic growth. We are becoming a nation where wealth, aspiration, and success are accepted rather than encouraged. The dumbing down of the debate over GERS suits many nationalists and until we have this adult discussion we will never develop a vision for a successful Scotland. Sorry, Anon@15.03, I have no idea what the "Dutch disease" is. Would you mind explaining? Kev, a friend of mine reckons the funding gap as presented by the GERS figures was/is deeply flawed for a couple of reasons. 1) it calculates our spending based on being part of the U.K. So it still takes into account things that an independent Scotland would never pay for (Crossrail, HS2, Trident etc.). 2) it calculates our share of the oil revenues as 9%, so even at the paltry £1.4 billion it currently shows, an independent Scotland would likely be getting around 9 times that amount. Which would make a rather large dent in the predicted deficit. Also I think Brian Taylor, the BBC political editor, also dismissed GERS. Well, that was interesting. I mean, of course, the overnight report of Sturgeon's move to prepare for a second referendum. The expected triumph of hope over experience as Dr Johnson might have said. So, how to read the latest development? It could be read straightforwardly. Sturgeon knows that the next 4 years of Government, with the SNP as the sole party of Government, will be a hard grind. Osborne's tax changes in the upcoming budget will likely make Scotland's task that much more difficult of reducing its appalling budget deficit. Reduced government expenditures and increased taxes will produce a grinding environment where the SNP will cop some of the flak, even if the grievance politics continue. So, dash now for independence. The underlying political calculation is presumably the gap between the proportion of the electorate that votes SNP (60%) and the smaller proportion that votes Yes (45%). Bridging that gap must seem so tantalising if you want to achieve an independence putsch. And we should be under no illusion: a putsch based on pixie-dust and a neuralgic sense of grievance is what Sturgeon hopes will carry the day. Two other possibilities are that (i) it is a cold-blooded attempt to lower the expectations of the SNP for a generation, or (II) a gamble that oil prices will rise in the not-too-distant future and lift Scotland off the rocks. The premise behind the first is that oblique acknowledgement by Sturgeon during her education campaign of the consequences of the GERS figures will continue to scare the Bejeezus out of the said 15%, so that the Yes vote is stuck at 45%. Possible, but a bit of a stretch for someone who has been pro-independence since she was 16. The alternative is that the siren voice of Salmond ("trust me, I'm an oil economist") has persuaded her that revenue rescue is not that far away. Of course, she has to persuade lenders and the EU to take this view, and they are not stupid. They can see that she and the SNP are hooked on the good things of life. On the question of currency, much will be made of Mervyn King's recent comments about the use of sterling. However, Mr King will need to be consistent with the views expressed in his recent book about currency unions. His objection to the Euro is the cost to some of the EU economies (Spain, Portugal, Grrece, Cyprus, etc.) from sharing their currency with Germany, Holland, etc. , where the only way of remaining competitive is a substantial fall in wages. The cost to Scotland of using the pound will be the need to keep wages down to prevent jobs moving to rUK. A low wage economy with so many freebies to support. Best of luck! With respect to your friend he's extremely ill-informed. The GERS figures used are the "geographic share of oil" version that gives us 100% of "our oil". The costs allocated in GERS are assessed by the Scottish Government based on our share of value - so *nothing* for Crossrail (etc.) and only 2% of HS2 as our share of value. Trident is maybe £0.3bn or annum and its scrapping included in the White Paper's £0.5bn saving. The SNP don't even dismiss GERS - they used them for the White Paper and leant heavily on them for the Indy case when oil was booming. They are the numbers we have, they are what we'd be using to negotiator with EU and international lending markets and UK on currency. The core issue that the SNP just refuse to face for entirely illogical reasons in terms of their constitution clause 1 but self serving reasons in terms of popularity and power is that the Scottish deficit is something that could be addressed by a very simple solution. Remove the Barnett premium of £7bn a year and the Scottish deficit becomes at one with the UK. The Scottish problem is not the amount of onshore tax revenue which is near to the UK average, it is expenditure that greatly exceeds the onshore tax base and this wedge is driven home by the 50% Barnett gift. Logically, the SNP should be working towards FFA which would require the phasing out of subsidies and preferential funding such as Barnett. This would be viewed a getting Scotland ready for independent fiscal management. Defying logic, we see instead the SNP gloating that Swinney has secured a cut of future English income tax receipts for Scotland. Spending English taxes will only raise the deficit of Scottish tax yield compared to overall expenditure further. It's all very counter intuitive, it's all very illogical, it's so SNP. I have a little shocked at how un-surprised i was at the figures. If we ran a deficit this year, what about previous years? How much money does Scotland owe and is it sustainable going forward? Independent or not Scotland faces a huge uphill task to sort out our public finances and it is going to take collective responsibility from all parties to resolve this issue. I'm not holy optimistic about that because it is not in the SNP's interests to admit Scotland has a huge problem with low taxation and high public spending. Perhaps if they are re-elected, as the polls suggest, they might because they will have another five years in office. But I'm equally pessimistic about Scottish Labour's desire to grasp the mettle and sort out Scotland's public finances. If Scotland was to ever get close to a budget surplus, this might strengthen the SNP's case for independence once again. This is unlikely though because the new powers Scotland is about to receive over tax are very limited. Both reserved and unreserved spending is fixed by the UK Government so we can't reduce spending levels. To close the deficit, income tax would have to rise to eye-watering levels, perhaps a rise of 10-15p instead of Labour's 1p which only brings in an additional £500 million. I find your blog an good source of reliable info. I'd like to follow you on twitter ahead of the Scottish elections but you previously blocked me. We had a fairly mild mannered exchange without swearing and insults but I'm guessing you found it annoying, which is fair play. Perhaps we should be asking an alternative question - given the extent to which Scotland is now subsidised by the rest of the UK (principally England), would it not make financial sense for them to be forcibly ejected from the rest of the country and left to fend for itself? From the viewpoint of south west England, with all the lack of investment and rundown facilities of Cornwall, Devon, Somerset and Dorset, it is extremely difficult to see any benefit in continuing to subsidise Scotland. People are beginning to wake up to the fact that Scotland maintains a standard of living higher than their own thanks to generous payments to an Edinburgh administration that does nothing but whine and complain. It is called biting the hand that feeds you. It is noticeable that for the first time ever I am beginning to hear murmurings about what a pain in the posterior the Scots are and a creeping indifference to their complaints. It is a shame given the contribution Scotland had made to the Union over three centuries. So, what would be the financial benefits to the rest of the UK of Scotland's departure? To what extent would independence, forced or not, help the rest of the UK deal with its budget deficit and borrowing requirement? Would we be better off without Scotland and to what extent? At 14.22, the FM says she understands the difference between "deficit and debt". Why are you showing surpluses in your charts? Who me? There are no charts in this article. You might be confusing when I (always clearly labelled) chart deficit *difference* vs UK or rUK? 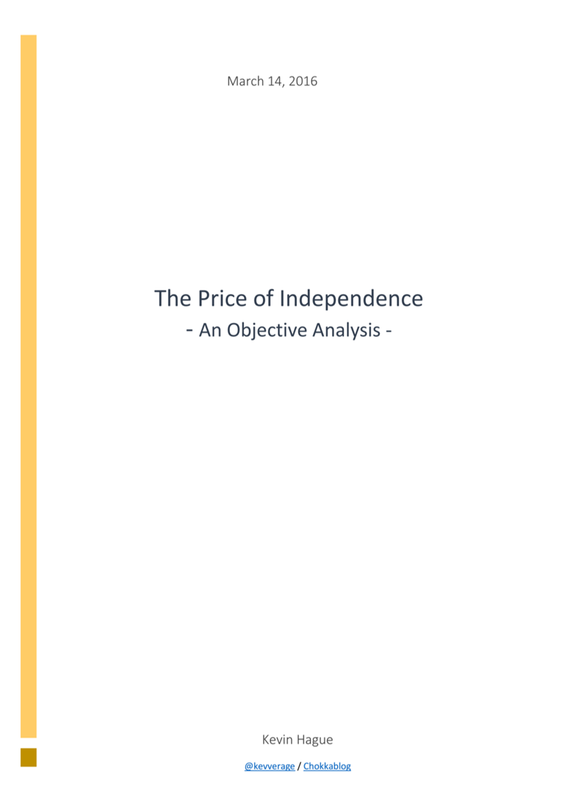 Well on a day with other, rather depressing and - potentially - intractable issues on the news, I thought I'd distract myself with a read through various articles and reviews of that other apparently intractable issue - Scottish Independence and how to fudge the issue of the income v spend. The news today on SNP tax plans (and I think its a fairly safe assumption at the moment that of all the parties, only the SNP have much hope of being in a position to implement their policies in the next few years) seems to indicate that they want to continue to avoid starting to answer the hard questions that Kev's graphs lay out. Perusing the comments below the Herald & Scotsman's articles on the general subject seems to indicate that things haven’t moved on much (despite the heroic efforts of this blog to explain) – I still see the same old half-truths and complete untruths being pushed. I mean to say, I may find the hand waving that goes on about how Scotland could grow its way out of the hole somewhat implausible in any likely scenario except the really long term, but at least it’s a discussion point – but when you see people repeating blatant untruths about GERS only having a population share of “Scotlands Oil” then you do sometimes wonder where they are getting this stuff – or if in fact its just “repeat a lie enough times and it will become a truth”. I do see some people pushing the “its not about the money” line. Fair enough – but first I doubt they fully realise its not just the loss of some pocket money – it would be really painful, and second, OK, but I doubt you’re going to be on 44.7% (or whatever) if you fess up to the full implications. Which leads me to my final point. What if it had been 50.1% (or whatever) “Yes”. Perhaps everyone would now be “pulling together”. However the sheer scale of the deficit would have revealed, in a harsh light, the “white paper” promises to be – well, frankly, worthless. I suspect the rest of the UK’s economy would also have taken a serious hit with falls in Sterling – with the finger being pointed towards Scotland as the culprit. All in all, I think it very likely that you could take the level of moaning about the “Vow” and whether it has been delivered, multiple that by 100, and that would be the level of discontent currently in Scotland. What would the end result have been? I don’t know, but I think Kevin’s final statement “We should probably be glad we voted No” is certainly the case, as I can see few likely “good” scenarios given what we now know would be the situation. It is universally accepted under the present system that Scotland's public spending is historically higher than most other parts of the UK. While it is generally accepted the cost of delivering public services in Scotland is more expensive due to our geography, I believe one major factor is being overlooked. I don't know the figures for rUK but one of the major contributing factors to our high levels of public spending is the cost of drug and alcohol abuse. According to the Scottish Government's statisticians, the combined cost on all public services of alcohol and drug abuse is £7 billion which includes the impact on police, courts, social work and healthcare. That's nearly 25% of our annual fixed budget for devolved services. There's no easy fix and the SNP have tried unsuccessfully to bring in minimum pricing for alcohol but even if it was introduced, there is no guarantee of success. But until our political parties seriously commit to addressing these problems, we won't be able to get our deficit down.